These are tough times for content creators over at YouTube. 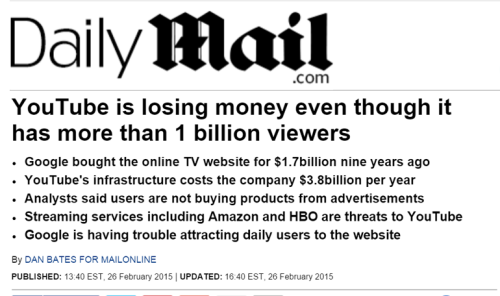 You’d think that with the streaming portal being bigger than ever, that there would be happy times, but with the recent problems with copyright complaint system, also comes news that Ad Revenue has plummeted with the rise in the use of Ad Blockers by viewers. Some are losing close to half their projected revenue, and it’s bound to get worse, which explains why YouTube is pushing so hard for content creators to sign on to YouTube RED. 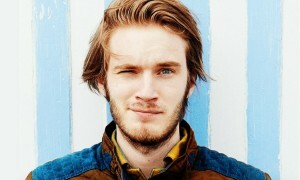 Felix “PewDiePie” Kjellberg is YouTube’s most popular content creator, he’s also the wealthiest with an estimated YouTube income of $7.5 million annually. But it might be almost twice that if it weren’t for the ad blockers that viewers employ as extensions in their browsers. But it doesn’t seem to bother PewDiePie much. 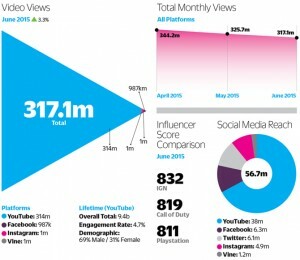 In fact, he’s more concerned about other content creators who aren’t as popular as he is. As the top dog on the YouTube pyramid, Kjellberg makes his living through so called “let’s play” videos, were he gets to play video games while his audience lives vicariously through his comedic, and often expletive filled, reactions to the games he plays. He gets so much attention, that a simple posting of a picture of the hotel he’s staying at will cause hundreds to show up to get a glimpse of him, and Tubular Labs calls his a top influencer for online media, with over 10 billion overall views, and an audience of over 40 million subscribers on his YouTube channel. So as you can see, PewDiePie has some juice. But there’s likely to be rough waters ahead on several fronts. While the Adblocker issue is definitely costing Kjellberg “walking around money,” there are several other facts which could kill the goose that laid the golden egg. Sony is trying to trademark the term “let’s play,” and that could also have a direct impact on the videos that PewDiePie posts, prompting him to change titles and edit content just to avoid the next road block … The dreaded takedown. Now I rather doubt that YouTube is going to kill PewDiePie’s channel over an intellectual property (I.P.) accusation if it wasn’t for the fact that the I.P. complaint system is automatic. If a user feels their trademark has been pirated or maligned, or if the content ID system trips over the user of the I.P., the channel could be placed in limbo automatically, according to YouTuber Doug Walker. Walker has been chronicling his own troubles with keeping his channel monetized, following a complaint that caused him to get a copyright strike against his account, the loss of monetization, and an arbitrary 15-minute limitation placed on his videos. Doug Walker eventually got his monetization back, but he says that the appeal process is varied and frustrating, and while YouTube promises fast resolution, that hasn’t been his experience. Things are getting so bad, that several content creators are simply getting out of game. Now I don’t think that PewDiePie will walk away from the millions he enjoys, but he could certainly make a point or take his content elsewhere. But for now, his biggest worries are how to get users to enjoy his content without losing his shirt, and Kjellberg thinks that YouTube’s subscription service RED may be the best solution to offsetting that loss of revenue. Kjellberg cites a Daily Mail bullet point list (see above) that shows that while YouTube has over a billion active users, they’re still not making money. According to analysts, ad blockers are having a devastating impact, and of those who don’t employ them, well, those users are not buying products from the advertisements that are viewed (or clicking). 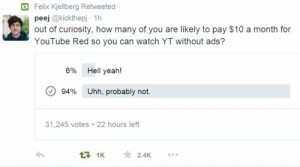 PewDiePie says that YouTube RED is a counter against AdBlocks, and that while YouTube is now paying creators during the a subscribers free trial, the more important issue is to understand the problem, and devise methods to counter it that doesn’t alienate their audience, or hurt smaller content creators who can’t absorb the losses like Kjellberg can. But that message isn’t getting through. 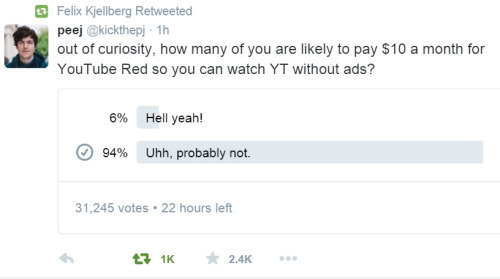 According to Kjellberg, views are either unconvinced, or unwilling to pay for the same content, even if it comes to them ad-free. In a snap poll of over 30,000 of his fans, 94% of his audience said that they wouldn’t be interested, even if it means they can still support their favorite content creators, but avoid ads. Apparently, they want their cake and eat it too.